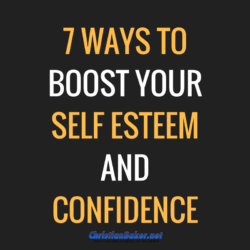 Discover 7 Ways To Boost Your Self Esteem and Confidence. Would you like to increase your confidence and self-esteem? If so, stay tuned as I share 7 simple ways that you can easily increase your self-esteem! Would you like more self-confidence and greater self-esteem, I think even the most confident people would like a boost. But first let’s look at the difference between confidence and self-esteem, as these are words that often get confused or miss used. Firstly, confidence is the belief in our ability to do a particular task or activity. For example, you may be 100% confident that you can walk, tie your shoe laces or many other tasks you do on autopilot. If it’s something new, or something you’re just mastering, your confidnce may not be as high. Where as self esteem is your overall feeling and belief about yourself, which is impacted by your confidence in different areas of your life. And sometimes in life, either for some known, or unknown reason we reach times where we could do with a boost in our self-esteem. So here are 7 simple and effective ways you can develop your mindset and your inner self esteem and confidence. Think of it like developing your physical body, there are many different ways you can do it, but you wouldn’t expect to do a physical exercise once and master your ultimate level or strength and fitness and your inner mind fitness is the same, it’s something you can continually develop and master. 1- Be mindful – be aware of your self-talk, the words and the language you use. Stop using negative language like I can’t and I’m useless, and use more positive empowering language. 2- Ask yourself better questions. And use affirmation to affirm and focus your mind on how you want to be. 5- Adopt positive daily habits and rituals that develop your self-esteem. 6- Practice gratitude – and develop your gratitude attitude. 7- Change your mind – programme your mind. Here’s a video where I share 5 ways to re-programme your mind. There’s lot of other ways you can increase yourself, but I hope that’s given you a few ideas and some inspiration to develop your self-confidence. Thanks for reading and watching and if you found this post helpful, please click subscribe and subscribe to my youtube channel to get all future episodes.